This was a long project with many planning and technical delays waiting for the Build project to progress, however the end result is a superb sounding system with Linn Digital Streaming playback for the most used rooms. The less used rooms use Sonos music players to keep the cost down. There is a Media Equipment cupboard where we made sense of the mass of data wiring. 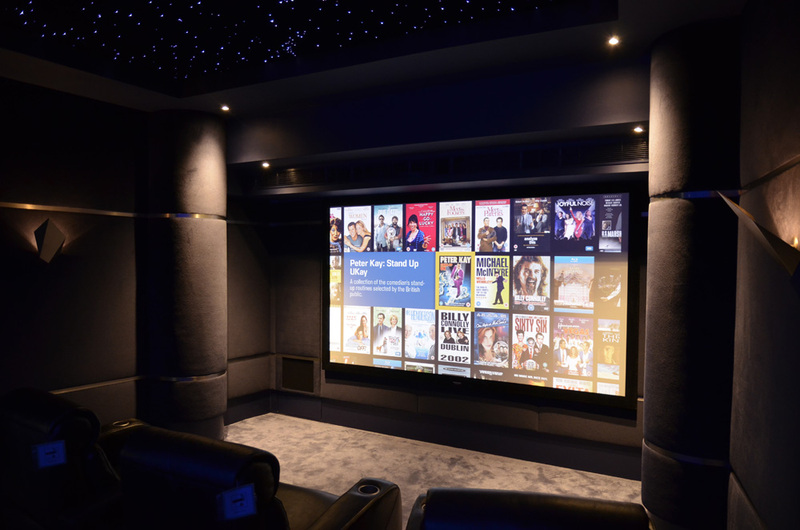 This was designed to be as flexible and future-proof as possible, allowing data, music and video to be streamed to any room. The Equipment Rack included: Kaleidescape Video Serve; Kaleidescape Disk Vault; Zoneripper Music Server; 2 x Sky Boxes; 6 zone HD Anywhere HD Distribution; 52 port managed Gigabit Data switch; Cat6 Patch panels to all rooms; Coax Patch panels to all rooms; TV Distribution Amplifier; CCTV IP HDR; Broadband Router; Global Cache control hub. 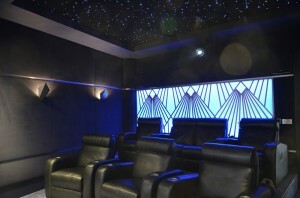 The Dedicated Cinema room was built with quality in mind. This has a 9′ screen with Paradigm Signature LCR5 speakers behind the screen, Paradigm Signature ADP rear channel speakers and a massive Paradigm Sub15 subwoofer providing the grunt. 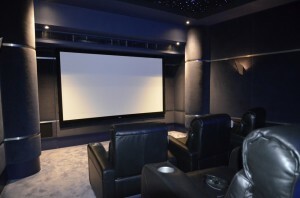 The picture was generated from the superb Sim2 Mico 150 LED projector, for a pin sharp image, and also meaning that bulb life should never be a worry. 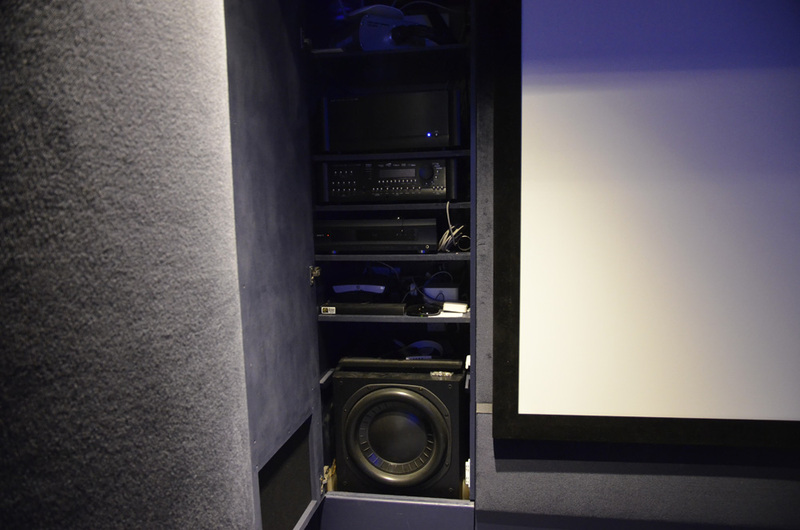 There are two tiers of comfortable electrically adjustable seats, and the padded walls and specialist soundproofing ensuring that even at ear-popping volumes this system will sound fantastic and won’t trouble others elsewhere in the house. The special feeling in the cinema room is finished off with a fibre-optic star ceiling with Multi colour LED driver coupled to the lighting system. 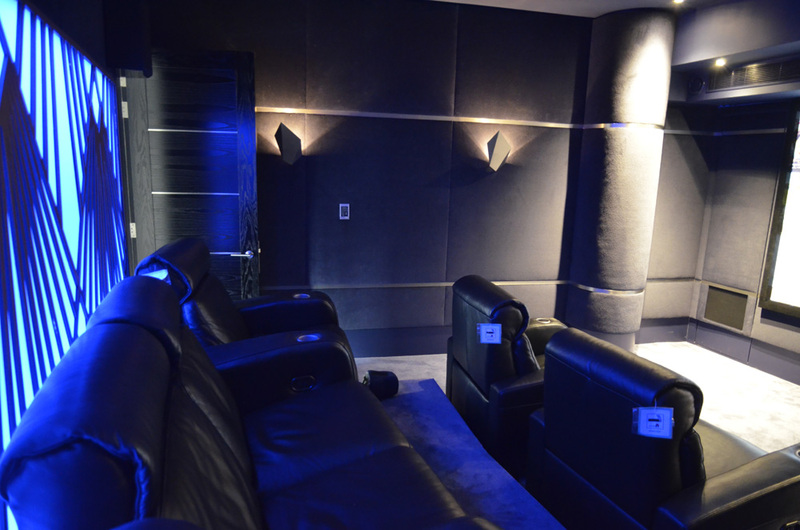 This was one of our dream projects where we were able to put together something really special for the clients. A system that they use daily and will enjoy for years to come.